Tin glazed earthenware (mailoica) plate decorated in blue. In the centre depicting St Jerome contemplating a skull. Siena, Italy: ca.1530. Italy is a peninsular fortunately placed, in the centre of the Mediterranean, to take advantage of numerous trade routes linking East and West. Throughout the Renaissance, Italians continued to import ceramics from abroad, especially from Syria, Turkey and Spain (the southern part of which was under Islamic rule). The forms and decoration of early Italian maiolica betray their Islamic origin and, even after Italian artists had developed their own style of ornamentation, Eastern influences were still apparent. By the mid-fifteenth century porcelain from the Far East and porcelain-like objects from the Islamic world appear officially documented in Italian collections and were, therefore, more readily available sources of design. By the sixteenth century Iznik ware began arriving from Turkey. These ceramics were produced in blue and white , as well as in polychrome colours, and feature foliate and floral designs, carnations, palmettes, roses and feathery tendril-like leaves. Its brilliant decoration on pure white ground must have made it almost indistinguishable from porcelain. It is not certain whether Italian artists copied designs directly from Chinese examples or Islamic types imitating porcelain. It is likely that both were used, depending on their availability. In this example, the subject of St Jerome, rendered in the painterly style associated with native Italian istoriato artists, is surrounded by an abstract foliate pattern in blue and white derived from Eastern sources. 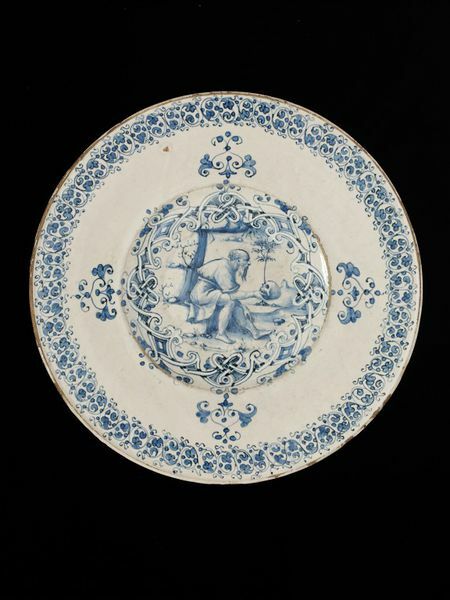 This plate is shown by its inscription to have been made in the workshop of Maestro Benedetto. It is recorded in the Archives of Siena that Benedetto was the son of Giorgio of Faenza; the earliest mention of him is in 1509, when he is stated to have been living in the city about six years. The latest mention is made in 1521-1522 when he was elected Console of the city. Plate. In the middle, within a border of inter-laced strapwork with four arabesque motifs radiating from it, is an old man seated on a rock contemplating a skull (probably St. Jerome in the Wilderness). An arabesque border encircles the edge of the rim. On the back a leafy scrollwork and, in the middle, a tablet inscribed: fato i siena da mo benedetto. Historical significance: By the sixteenth century Iznik ware began arriving from Turkey. 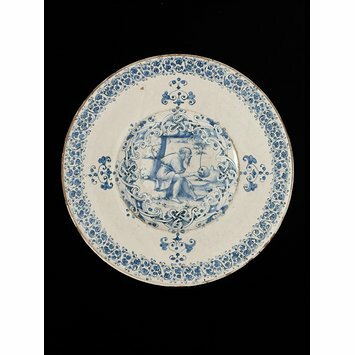 These ceramics were produced in blue and white, as well as in polychrome colours, and feature foliate and floral designs, carnations, palmettes, roses and feathery tendril-like leaves. Its brilliant decoration on pure white ground must have made it almost indistinguishable from porcelain. It is not certain whether Italian artists copied designs directly from Chinese examples or Islamic types imitating porcelain. It is likely that both were used, depending on their availability. In this example, the subject of St Jerome, rendered in the painterly style associated with native Italian istoriato artists, is surrounded by an abstract foliate pattern in blue and white derived from Eastern sources. Italy is a peninsula fortunately placed, in the centre of the Mediterranean, to take advantage of numerous trade routes linking East and West. Throughout the Renaissance, Italians continued to import ceramics from abroad, especially from Syria, Turkey and Spain (the southern part of which was under Islamic rule). The forms and decoration of early Italian maiolica betray their Islamic origin and, even after Italian artists had developed their own style of ornamentation, Eastern influences were still apparent. By the mid-fifteenth century porcelain from the Far East and porcelain-like objects from the Islamic world appear officially documented in Italian collections and were, therefore, sufficiently accessible sources of design.